There have been a couple of new posters that have hit recently, but the one I personally wanted to highlight is this one for an upcoming indie film called Night Catches Us. 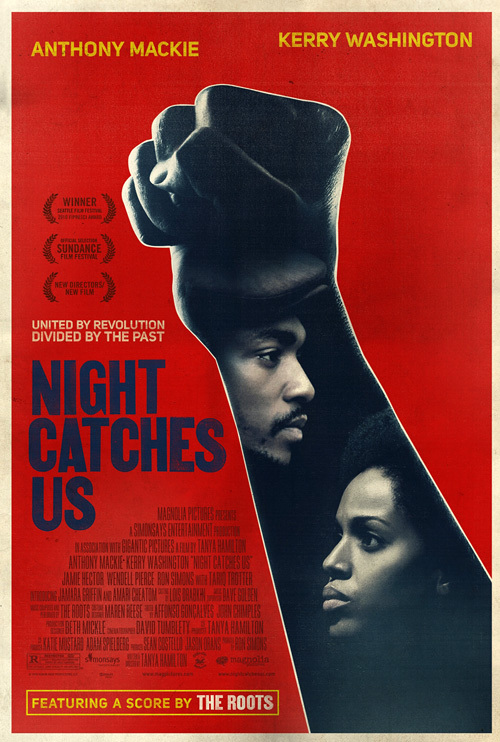 This period drama about the Black Power movement first debuted at Sundance to fairly positive reviews, especially for star Anthony Mackie (who you may recognize from The Hurt Locker or We Are Marshall). I haven't personally had the chance to see it, but it's hitting theaters and VOD soon, so beyond featuring this great poster (via Movieline), I wanted to let everyone know about this so that a few of you might actually watch it once it's out. Visit its official website. Set in 1976, complex political and emotional forces are set in motion when a young man (Anthony Mackie) returns to the race-torn Philadelphia neighborhood where he grew up during the Black Power movement. Night Catches Us is both written and directed by first-time filmmaker Tanya Hamilton, of only a 1995 short called The Killers previously. Shot mostly in Philadelphia, this first premiered at the Sundance Film Festival earlier this year and was later acquired by Magnolia Pictures for limited US distribution. Night Catches Us premieres on VOD (via Xbox, Amazon) on October 29th, and opens in theaters on December 3rd this year. i haven't heard of this before now. if it's as good as 'deacons for defense", i'm excited.